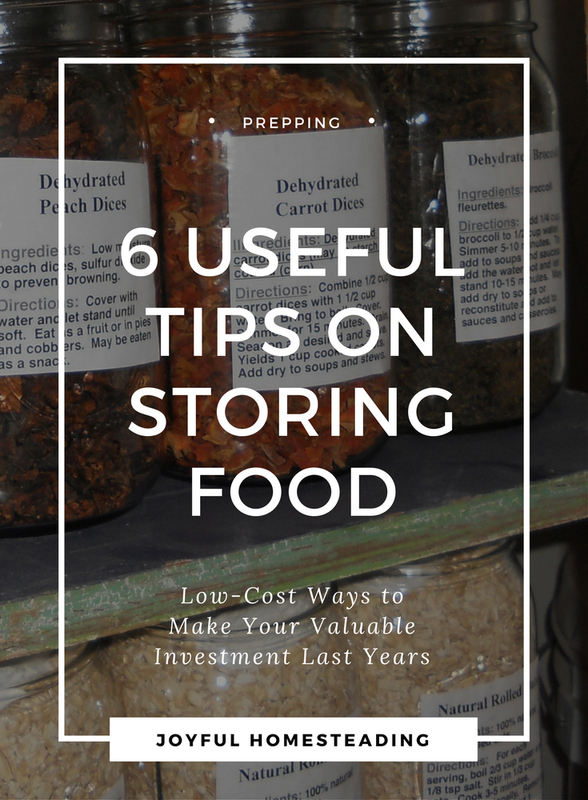 A food storage tip or two will protect one of the most valuable investments you have - your storable food so that you can enjoy it for years rather than months. The greatest enemy to all storable food is oxygen. Oxygen allows the microscopic critters in many foods - such as grains, cereals and pasta that is made from grains - to grow, thus destroying your food. So the number one goal of storing food is to keep as much air from your food as possible. An inexpensive and fairly effective way to do this is to buy quart-size freezer bags. 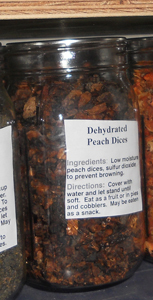 Then divide up your bulk purchase of dehydrated vegetables, cereals, beans, etc. and place them in the freezer bags, pressing out as much air as you possibly can. Then place the bags in five-gallon plastic containers that have never held anything except food. You can find these at paint supply stores, but make sure they are new and unused. I have had storable food last two years that way, although I wouldn't recommend it for pasta or other processed foods. But one of the best food storage tips I can give you is to invest in a vacuum sealer. They are fairly affordable - at the time of this writing you can get a decent one for $70 to $140 (you can see one here) and can lengthen your food for two years or more depending on the type of food you are storing. By using a vacuum sealer, your dehydrated vegetables can last for up to ten years, and your whole grains, such as wheat and rye, can last for decades if sealed properly. The more oxygen and light you keep away from your dehydrated vegetables, the longer they will last. But if you vacuum seal dehydrated vegetables in plastic bags, the vegetables will clump together and turn into a hard rock. You can break them apart again and use them, but it will be a challenge. Instead, purchase mason jars and a mason jar attachment for your vacuum sealer (find one here). Vacuum seal your dehydrated vegetables in mason jars and not only will they not clump together, but they could last up to ten years. Likewise, cereals such as oatmeal or bran, shouldn't be stored in plastic bags because not only will it crush some cereals, but they could also eventually develop a plastic aftertaste from the bags. Instead, place these in quart-size or half-gallon sized jars and vacuum seal them. If left exposed to the air, dry beans will eventually get stale and never truly become tender when cooked. Prevent that by vacuum sealing your beans in plastic bags or in mason jars. 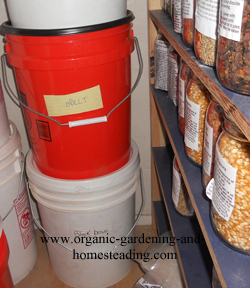 Beans will also last well if placed in quart-sized freezer bags (all air pressed out), and then placed in 5-gallon polyethylene buckets. Light will also wreak havoc with your vegetables and other foods, over time depleting them of vital nutrients. 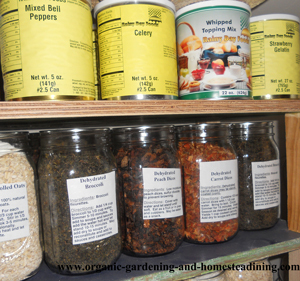 So store all of your bulk wheat, other grains, beans, cereals and dehydrated vegetables in a cool, dark place. Those plastic bags, or more specifically those vacuum sealer bag rolls (see them here), are a boon when it comes to storing meat in your freezer. There is nothing worse than an expensive cut of meat that's shriveled and dried up and surrounded by ice. Yuck. Instead, wrap that cut of meat in plastic wrap and then place in a vacuum bag. Seal it, label it with a Sharpie marker stating what it is and the date it was sealed and then freeze it. Your meat will last at least two years that way. I would never dream of butchering chickens without having a vacuum bag roll or two on hand.